Despite groundhogs disagreeing about how many weeks of winter remain, Picton’s first-ever Ice Box event is ensuring that winter remains a fun time in the county this month. This new free event brings together art, dance, music and more between Feb. 2-10, with activities centred in Macaulay Heritage Park. On opening day, visitors got their first look at the five Ice Boxes — wooden huts painted in vibrant colours and filled with interactive art installations for all ages. There was a steady stream of visitors on the opening Saturday, helped by temperatures that were considerably warmer than the previous couple of weekends, although still decidedly crisp. 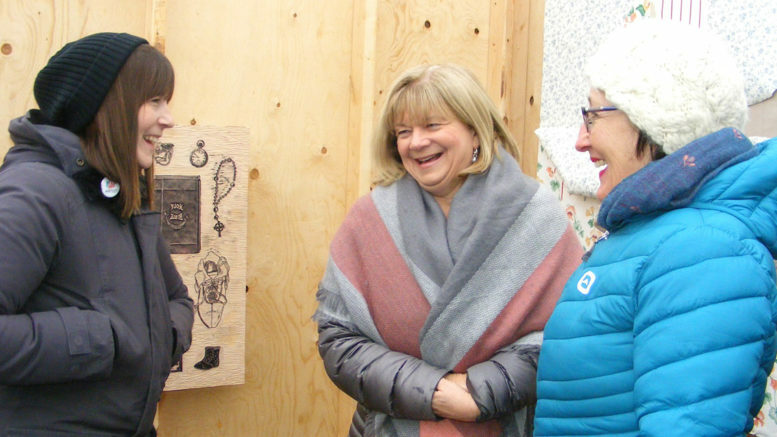 “It’s been good, considering it’s been windy and a little bit chilly,” said printmaker Chrissy Poitras, of Picton, whose work was featured in another Ice Box. There were opportunities to warm up, including snow pants yoga for kids, a crackle and pop dance for everyone, snowshoeing with the Picton recreation committee and wood-fired pizza made in the old Macaulay House brick oven. 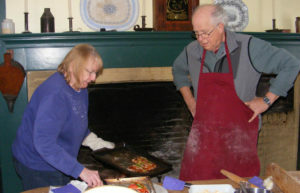 Volunteers Michael Miller and Nancy Woods teamed up on kitchen duty. Miller said the over is the oldest brick oven in Picton, and was built 188 years ago. Meanwhile, Sarah Selecky of Marysburgh and Susanne Larner of Picton were greeting people at their Ice Box art installation. The walls were decorated with murals by Larner, and the air was filled with hanging snowflakes which contained little hand-written stories created by local residents during a workshop hosted by Selecky earlier this year. The fun continued on Sunday with storyteller Debra Palmer, more pizza and dancing and live music by the Sophiasburgh All-Stars. Monday through Friday is devoted to school visits to give children a chance to experience art and winter in a new way. If you missed the opening weekend, there’s still time to take it all in. On Saturday, Feb. 9, Snow Pants Yoga for Kids is back at 10 a.m., with an all-ages improv workshop between 11 a.m. and noon in Macaulay Church. The pizza is back over the lunch hour, with dancing returning at 1 p.m. and Martha’s insta-comic book workshop taking place between 2 and 4 p.m.
Ice Box wraps up on Sunday, Feb. 10, with more pizza, more dancing, storytelling with Suzanne Pasternak and live music by Reggie Band in the afternoon. The only event that includes a cost is the Hothouse Mobile Sauna & Lounge, which will be available between 10 a.m. and 4 p.m. for people to melt away their winter blues. For prices and details, go to hothousesauna.ca. There will be a community parade around Macaulay Park from 3 to 4 p.m. and everyone is invited to join in. Costumes and musical instruments are encouraged but not required. To relax after the festival, people are welcome to come to the official Ice Box after party from 5 to 8 p.m. at 555 Brewing Co. at 124 Main St. in Picton and meet the people behind the festival — the staff and volunteers of Macaulay Heritage Park and the Department of Illumination, the artist collective that created the Firelight Lantern Festival. For more information, go to www.iceboxpec.org.